Children like attending Church, and this instinctive attraction to and interest in Church services is the foundation on which we must build our religious education. 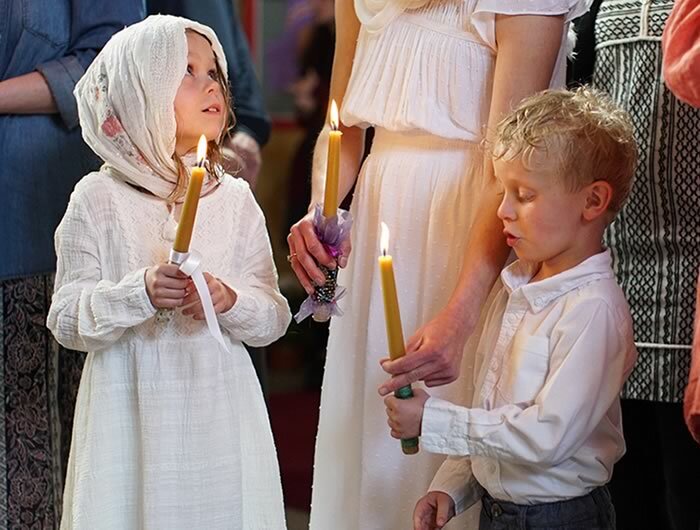 Children penetrate more easily than do adults into the world of ritual, of liturgical symbolism. They feel and appreciate the atmosphere for Church services. The experience of Holiness, the sense of encounter with Someone Who is beyond daily life, that mysterium tremendum that is at the root of all religion and is the core of our services is more accessible to our children than it is to us. "Except ye become as little children" these words apply to the receptivity, the open-mindedness, the naturalness, which we lose when we grow out of childhood. Therefore, the first duty of parents and educators is to "suffer little children and forbid them not" (Matt. 19:14) to attend Church. It is in Church before every place else that children must hear the word of God. In a classroom the word is difficult to understand, it remains abstract, but in church it is in its own element. In childhood we have the capacity to understand, not intellectually, but with our whole being, that there is no greater joy on earth than to be in Church, to participate in Church services, to breathe the fragrance of the Kingdom of Heaven, which is "the joy and peace of the Holy Spirit." At Holy Theophany, we love that our divine services and parish activities are full of youthful noise and energy! Our church school programs are designed to bring our young parishioners more deeply into communion with our Lord Jesus Christ and each other. Our parish holds weekly youth school meetings and provides other opportunities, including scholarships for our deanery summer camps and youth retreats.